The CCSD Math department provides students with a comprehensive and rigorous understanding of mathematics enabling them to communicate and connect to the world around them. All students will be empowered and equipped to problem-solve and use the tools of mathematics, challenge them to think for themselves and engage in a purposeful community of learning to build and innovate their future world. The student should be interested in pursuing either an IB diploma or a certificate in IB Math Studies (Group 5). Topics studied will include statistics, sets and logic, trigonometry, geometry, probability, matrices and graph theory. Students will complete a five week project as well as take the IB Math Studies examination in May. A Texas Instruments TI-84 graphing calculator is required. This course will introduce students to college level math topics without the rigor of Pre-Calculus. Some topics in this course include statistics, matrices, functions, and linear programming. Math 12 will provide an excellent preparation for Pre-Calculus in college. A Texas Instruments TI-84 graphing calculator is required. This course will prepare students for the Algebra Common Core Regents Exam to be taken in June. This exam is a graduation requirement. The emphasis of this course will be on algebra and functions. Students will study and compare linear, quadratic and exponential models. They will relate these models to examples with the use of statistics. There will be an emphasis on the application of these skills to real world situations. A Texas Instruments TI-84 graphing calculator is required. * Please note that this course is not an approved Math course through the NCAA clearinghouse. This course is the first year of a two year sequence that will prepare students for the Algebra Common Core Regents Exam to be taken in June of the second year of the course. This exam is a graduation requirement. This is a co-taught class that has fewer students thereby offering more individualized instruction. The emphasis of this course will be on algebra and functions. Students will study and compare linear and quadratic models. They will relate these models to examples with the use of statistics. There will be an emphasis on the application of skills to real world situations. A technological approach to solving problems will be taken where appropriate. A Texas Instruments TI-84 graphing calculator is required. This course is the continuation of Algebra ABC-1. This is a co-taught class that has fewer students thereby offering more individualized instruction. Students will study algebra as it relates to linear, quadratic, and exponential functions. Students will continue the study of statistics. There will be an emphasis on the application of these skills to real world situations. Students will take the Algebra Common Core Regents Exam in June. A Texas Instruments TI-84 graphing calculator is required. This course is designed to teach students how to use math in their everyday life and in their careers. Topics covered include Gross Pay, Net Pay, Banking, Loans, Credit Cards, Investments, and Insurance. Students can use this course as their third year of Math. This course will prepare students for the Algebra Common Core Regents Exam to be taken in January of their second year of math. This exam is a graduation requirement. This is taught by two math teachers and has fewer students thereby offering more individualized instruction. The emphasis of this course will be on algebra and functions. Students will study the first 2/3 of the curriculum comparing linear, quadratic and exponential models. There will be an emphasis on the application of these skills to real world situations. A technological approach to solving problems will be taken where appropriate. A Texas Instruments TI-84 graphing calculator is required. Prerequisite: A grade of 70% or higher on the Algebra II exam and teacher recommendation. The student should have a strong background in mathematics as this course prepares students for calculus. The major emphasis is on the study of functions with other topics from analytical geometry and advanced algebra, including the study of matrices. A Texas Instruments TI-84 graphing calculator is required. This course is equivalent to the Introduction to Statistics course required at most colleges and universities. The course may be taken after Algebra II or Pre-Calculus or may be taken concurrently with Pre-Calculus and AP Calculus. A TI-84 graphing calculator is required. Students are encouraged to take the AP exam in May. College Business Math deals with management of personal finances over the life cycle of the individual consumer. Topics covered include establishment of personal financial objectives, budgeting, use of credit, property, liability and life insurance, major purchases such as housing, transportation and education; taxes, savings, investments, and retirement and estate planning. The student must have a very strong background in mathematics and have a high degree of motivation to continue his/her study of higher mathematics. The course follows the syllabus for Advanced Placement Mathematics, Calculus AB. A TI-84 graphing calculator is required. Students are encouraged to take the Advanced Placement Examination in Calculus in May. Prerequisite: Successful completion of Algebra II and recommendation from math teacher. The student should be a motivated mathematician who is interested in pursuing either an IB diploma or a certificate in IB Math Methods (Group 5). Topics studied will include functions, the parabola, transformations, logarithms, vector geometry, and matrices. These will be studied at a rapid pace. 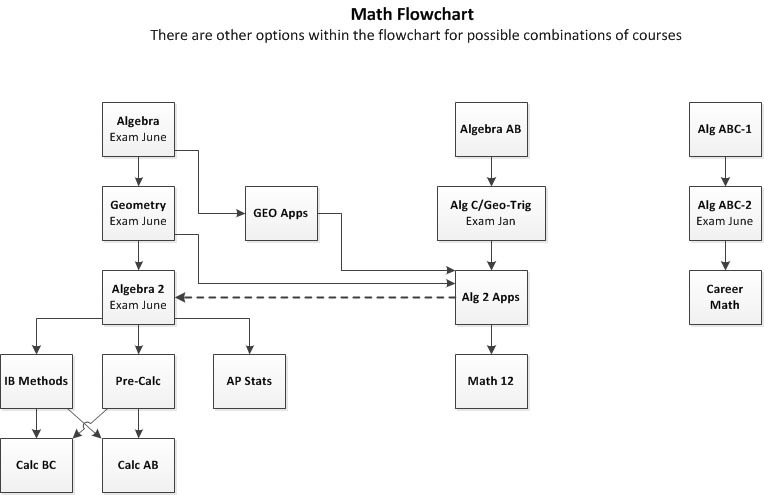 Students will complete portfolio assignments as well as the IB Math Methods examination in May. Highly successful students in this course will be recommended for AP Calculus BC the following year. A Texas Instruments TI-84 graphing calculator is required. This college course is an extension of the introductory class. More advanced programming techniques will be taught using the Java language. Upon payment of the tuition and achievement of a passing grade, 3 credits from FLCC will be awarded. It is possible to take this course for no college credit on a tuition-free basis. This course is for students who have an interest in the computer science field. Topics of study include introductory programming concepts such as input and output devices, processing, conditionals, loops. More advanced topics such as methods, arrays, sorting and searching will also be included. All programming will be using JAVA in the eclipse environment and CodeLab. Some web design will also be taught using HTML. Non-coding topics included are the binary number system, computer ethics, designing apps and flowcharting/algorithm creation. Much of the focus in this course is learning to program. Students will work independently and in groups designing, writing and debugging programs. The ability to be a self-starter is a must. Students will create their own game as a final project. This college course is for students who have an interest in the computer science field. Students will engage in activities that show how computing changes the world and impacts daily lives. The topics of study will include history of computer development, computer hardware, networks, the Internet, web design (HTML), algorithms, programming, data representation, searching, sorting and ethical computing. Students will develop step-by-step written solutions and will then be required to implement these solutions on a computer using a programming language (JAVA). AP Computer Science Principles requires students take the AP exam as well as to complete a written report that includes collecting data on an approved topic of their choice. Students must work individually as well as in teams of two students to write a program related to their focus area. Prerequisite: A grade of 65 or higher on the Geometry Regents exam, an 80% average or higher in Geometry, and Teacher Recommendation. This is the third course in the Regents sequence. Topics include functions, complex numbers, quadratics, exponents, logarithms, trigonometry, sequences and series, probability, and statistics. This course is a pre-requisite for IB Math Methods or IB Math Studies. Students will take the Common Core Algebra 2 Regents exam in June. A Texas Instruments TI-84 graphing calculator is required. The course will provide an excellent background for college level mathematics. Topics include functions, complex numbers, quadratics, exponents, trigonometry, and statistics. A Texas Instruments TI-84 graphing calculator is required. This course follows the syllabus for Advanced Placement Mathematics, Calculus BC. A TI- 84 graphing calculator is required. Students are encouraged to take the Advanced Placement Examination in May. This is the second course in the Regents sequence. Students will study topics including Euclidean proofs, coordinate geometry, transformational geometry, trigonometry, 3-D geometry and circles. This course prepares students to take the Geometry Common Core Regents exam in June. A Texas Instruments TI-84 graphing calculator is required. This course will give students an application approach to geometry. Students will use geometer sketchpad to study topics such as quadrilaterals, constructions, coordinate geometry, and transformations. Euclidean proofs will be de-emphasized. This course covers the last 1/3 of the Algebra curriculum and is taught at a slightly slower pace. This is taught by two math teachers and has fewer students thereby offering more individualized instruction. During the first half of the year, students will finish the Algebra curriculum and prepare for the Common Core Algebra regents exam to be taken in January. 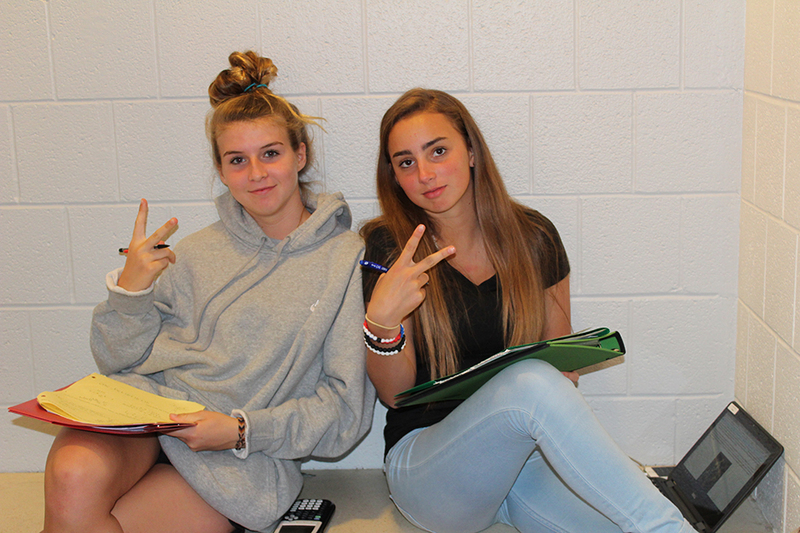 During the second half of the year, students will be introduced to both Geometry and Algebra 2 topics. A Texas Instruments TI-84 graphing calculator is required.